The most common type of failure in electric power systems is the single-phase to ground fault. It is the reason for up to 80% of all disturbances on high voltage systems. Significant improvement in power quality is achieved through the reduction of power outages by operating a network as a resonant grounded system (also known as a compensated system) by connecting the system’s neutral to ground through one or more high impedance devices. By utilizing an iron core reactor (Arc Suppression Coil (ASC), also known as Petersen Coil), which is tuned to the total system capacitance to ground, the original capacitive fault current (up to a few 100 A) is compensated by the inductive current of the ASC. Ø Compensation of capacitive reactance of transmission cables, in particular in networks with light or no load. Ø Reduction of system-frequency over voltages when a sudden load drop or no load occurs. 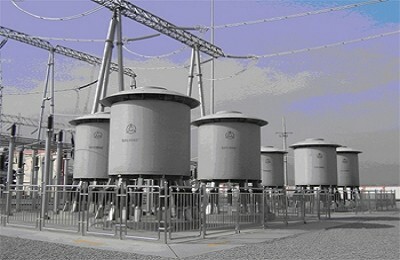 Ø Improvement of the stability and efficiency of energy transmission.